I’m always after that thing that will spur me on to write and review more regularly, so this year, I’m going to try sharing wrap-ups from my book club’s discussion. Maybe this may also help to inspire your club’s book selection or discussion as well. 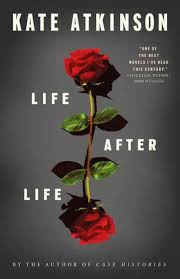 Recently, we met to discuss our last book from the 2013/2014 list – Kate Atkinson’s Life After Life. Life After Life centers around Ursula Todd and the various courses her life could take given different circumstances and decisions. In some chapters she dies early on – in other much later in life. In most, she experiences WWII, but from a variety of vantage points. Personally, I thought Atkinson attempted something that fell short. To me the novel felt like it needed more time in the editing stage – as if she was trying to meet a deadline and turned it in too early. I would have liked to have seen more progression and organization in how the stories were presented. For example, I would have like to have seen the chapters ordered in a way that she lives a little bit longer in each one. However, another in the group liked the variation and thought the disorder accurately reflected the natural chaos of life. We disagreed about the extent to which it seemed like Kate had knowledge from previous lives that help to influence her decisions. Atkinson brings up deja vu, and while Ursula experiences a sense of having been in places before, I didn’t feel like she exercised additional knowledge. Several of the girls in our group are history buffs and have an affinity for things pertaining to WWII, so Life After Life offered good discussion around things like the supposition of Hitler’s assassination and living through air raids in London. Also, we talked a good bit about changes in Ursula’s personality as well as the consistency (or not) of others around her. Best discussion question: Which decisions or events had the biggest impact on Ursula’s future? Best part of the book: Ursula’s friendship with Eva Braun.